GUILDERLAND – Jon N. Gray, 68, of Guilderland, died suddenly Wednesday, August 4, 2010 at Nathan Littauer Hospital in Gloversville while vacationing with his family on Great Sacandaga Lake. 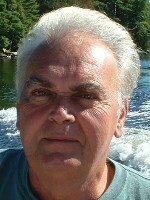 Jon was born in South Portland, ME, and lived in the Capital District since the early 1970’s. He served in the Air Force in Germany from 1959 – 1963 and was a graduate of SUNY Cobleskill. He served as director of food service for the Sterling Winthrop Research Institute in Rensselaer for many years. He was an owner of the Floral Designs shop in Colonie, and worked for many years in food service management at Alterra, Atria and the Eddy. Following his retirement, he eagerly explored new adventures, joining H&R Block in 2002, rapidly advancing to Senior Tax Advisor. His warmth and generosity earned him literally hundreds of loyal clients. Jon was a loving husband and incredible father. He thoroughly and completely devoted himself to his family. He spent many wonderful days on his motorboat teaching his daughter to water-ski and wake board. Jon brought great joy entertaining his family and friends with his culinary skills. He loved golf and was an ardent Yankees fan. Jon is survived by his beloved wife Carol Bianco Gray, and his cherished children Lainie and Bobbie. Other survivors include brothers David Gray of St. John, U.S. Virgin Islands, Bruce Hanken (Carol) of Maine; his sisters Betsey Keyes of Texas and Linda Stultz (Al) of Maine. He is also survived by his much loved father-in-law Donald Bianco (Sharon) of Florida, and brothers-in-law John Bianco (Mercedes) of Florida; Don and Chris Bianco of California; along with nine nieces and nephews. Funeral services will be held in the Hans Funeral Home, 1088 Western Ave., Albany, Monday morning at 10:00 a.m., and from there to Christ the King Church, Sumter Ave., Guilderland at 11:00 a.m. Relatives and friends are invited, and may call at the funeral home Sunday from 4-8 p.m. The parish family of Christ the King Church will gather at 4:30 pm Sunday in the funeral home for a service of prayer and remembrance. Interment will be in the Gerald B. H. Solomon Saratoga National Cemetery in Schuylerville. In lieu of flowers, memorial contributions may be made to the Center for Disability Services Foundation, 314 So. Manning Blvd., Albany, NY 12208; Church of Christ the King, 20 Sumter Ave., Albany, NY 12203; or the Food Pantries for the Capital District, 32 Essex Street, Albany, NY 12206. To leave a message of condolence for the family or obtain directions to the funeral home, please visit www.HansFuneralHome.com . Carol: When Ringo Starr sang about getting by with a little help from his friends, I think he was singing about you and John. He was a one-person support group for you–and you for him! It is clear from the way you talked about him that he was an amazing person, a wonderful husband and your soul mate. Please know that I feel your loss and am praying for you and your family. I send my sincerest condolences to Mrs. Bianco and her family during this very difficult time. Our hearts are heavy and we send our sincerest condolences to you. Our thoughts are with you and we will keep you in our prayers during this difficult time. Carol, if you need anything, please let us know and we will be there for you and the family. My condolences to you and your family. You are in my thoughts and prays. Though we have drifted apart for all these years you are still n my heart. I am so sorry for your loss. I will remember Jon with fond memories: his welcoming hospitality, his delicious meals, his sense of humor, his graciousness, his love of Carol, his stimulating conversations, and his acceptance of all!! My deepest condolences on of the loss of your husband Jon. I know he was not only a wonderful soul mate but a wonderful father to Laninie and Bobbie. I hope the many precious memories that you have as a family will lift and sustain you. My prayers go out to you and your family. My thoughts and love are with you, Lanie and Bobbie at this very painful time. You and your family have always been an inspiration and joy to know. Listening to people speak of him, it’s clear how much love there is. I am so sorry for your loss. You and yours are in my prayers. We were so sorry to hear about your loss. Please know that you and your family are in our prayers. You are in our thoughts and prayers in this difficult time. Jon’s warmth and inititiave were clear in your life and your every mention of your family. May you feel strength from your many friends! Mrs Gray I am so sorry for the loss of your husband.My sincerest condolonces to you. Carol I was saddened to learn of the death of your husband. Death is never easy, but the obituary is evident of a man who loved and was loved deeply. God bless you and keep you and may His face shine upon you and your loved ones. You are in my heart and thoughts. I am so sorry for the loss of Jon to you and your young ones, Lainie and Bobbie. May you find some peace their company in the nature you all love. Carol, I wish to express to you and your family my deepest sympathy on your loss. Our hearts and souls are with you and yours. My thoughts are with you and your family. I am so sorry to hear of Jon’s passing. Love to you and the kids. My sincerest condolences go out to you and your family. I will be making a donation to the Center for Disability Services Foundation in Jon’s name.